The first is a resilient plastic called polyethylene, followed by a middle layer of fabric mesh and a rubber-based adhesive on the bottom. It is thinner then foam tape and wider and glossier then masking tape, mostly because the waterproof and easy rip adhesive was originally produced for industrial applications. Consumers now put duct tape to vastly more creative uses then the patching up of air ducts, which was its original purpose. The product has become a national and international phenomenon. Duct tape is used to keep cracking side mirrors onto cars and repair body work in motor sports. The product is also employed as a temporary bandage and as an art supply for urban artists. Some teenagers even receive scholarships from the name brand Duct tape company by wearing duct tape clothes they fashion themselves to prom. The cultural phenomenon that is duct tape has surpassed its original role as industrial adhesive and become so significant numerous books have been written about its uses. 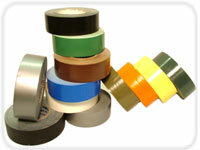 Duct Tape – Tape Solutions, Inc.
Duct tape is produced in very large quantities on a set of rollers. The adhesive is composed of rubber, resin and calcium carbonate and is made in a heated mixer. Tackifying agents, viscosity modifiers and antioxidants are added to the rubber compound. The adhesive and fabric are then combined using coating equipment. The fabric is put onto a roller mill, which consists of 2 hollow rollers made of stainless steel that rotates at a set speed. The adhesive is heated up and fed into a small space between the 2 rollers, which forms a thin, even sheet across the surface of the rollers. The cloth is then fed into the coating machine and runs against the roller with the adhesive, coating one side of it. After the coating process, the tape is then unspooled, where the large rolls are unwound, cut into smaller sizes and then respooled onto smaller cardboard cores in a process referred to as slitting. The tape is then packaged (usually shrink-wrapped) and ready for sale. Duct Tape Duct tape generally comes in either black or silver shades, but a few tape suppliers produce a variety of colors including clear. It is composed of three layers.